One exciting and often daunting element to being a doll artist is that you get requests for commission projects that challenge you. In recent weeks, I was challenged to ADD to existing vinyl to create a 1/4 scale Devon Aoki from an Antoinette mannequin. The present challenge is from a different client, and this time, I’ll be TAKING AWAY from the existing material. 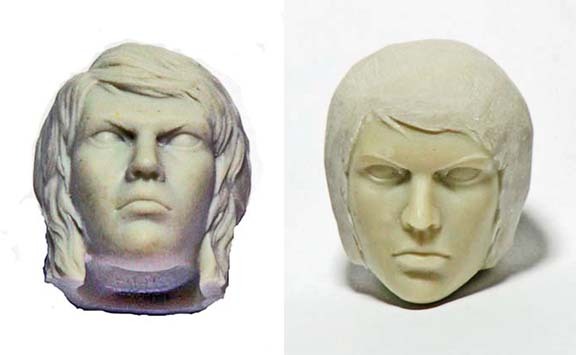 The victim: a resin female action figure’s head. You know how I adore working with action gals. There’s just something so mysterious and fierce about them. Action figure collectors also don’t mind a scar or two on their women, so I have a lot of fun with that too! This project begins with work on a “practice head”. My client was sweet enough and adventurous enough to play “guinea pig” for this uncharted OSS ground. I will switch to the “real” head once I’ve experimented with this one. So far, things are progressing well. Dh helped with a little belt sanding to remove the bulk of the hair. I then switched over to my Dremel tool to take away more and to smooth away the molded hair near the face. I did enough research to know that you should wear a face mask when sanding resin. I did wear one and yet, I’m thinking I might have to reserve this type of work for the out-of-doors. While the mask I wore filtered particulates, it only slightly lessened the odor…a sickly sweet aroma…of the resin. I didn’t “get high” or anything like that, but wow…I was surprised at the smell. So, here’s a pic of the work so far on the “practice head”.